Ah, fall. Enjoy these crisp, beautiful days while they’re here…and take care of your jet ski while you’re at it. The summer was a blast! It doesn’t get any better than jetting around the lake or ocean on your personal watercraft. Now that those days are coming to an end (well, unless you’re lucky enough to live somewhere like Florida), it’s time to winterize your personal watercraft so that you can be ready for action next spring. If you want a general idea of how much time it’s going to take and the types of things you’ll have to do to winterize, keep reading. Are the steps different depending on your ski? 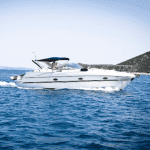 The work that you need to do to winterize your watercraft may be unique to your particular manufacturer and model. It’s a good idea to first take a look at your manual before beginning. Seem like it’s too much for you? A local marine dealer can help (for a fee I’m sure). When? When the days start getting cooler, the water temperature begins to drop. Don’t wait until the water becomes insanely cold before you remove your personal watercraft from it. That’s for your own comfort as much as it is to properly winterize the ski…think about it. Should I remove the gas…or not? There’s some debate on this point. Some recommend that you take your final ride (or two), and try to run a lot of the gas out of it so that you’re not storing it with a full tank. Some manufacturers recommend storing the ski with a full tank to reduce the risk of condensation in the engine (use gas stabilizer if you choose this option-more on this later). Wash it. Wash your ski very well to get the lake or ocean water off of it. If you’re really going to do this right, wax it with some nice car wax or get some specialty wax from your trusted boat dealer. Drain it. Make sure the stern is higher than the bow before you begin so that the water drains properly. Pull the plugs out, and let the ski run for just a few seconds (never more than 30) to get the water out of the inside of the hull. Should I use fuel stabilizer? If you use gas with ethanol, you’ll definitely want to invest in fuel stabilizer. Cover it. You know we have to get that in here. If you have a product as good as ours, why wouldn’t you want to share it with others? Check out our Covercraft custom covers—best fit, best protection, and you’ll enjoy looking at it during the winter. If you’re a more technical person, or taking your ski to a boat dealer, they may go a little further and put more work into winterization. Some manufacturers recommend that you disassemble parts of the ski for the winter. They will remove the air filters, spray fogging oil into the carburetors, remove the spark plugs, and sometimes completely remove the battery. Whether or not you take things this far depends on the length of your winter season and the recommendations for your particular ski. Read that manual! If you’re a visual person, you can always search YouTube and watch someone go through the steps that you need for winterization. There are videos specific to SeaDoo, Yamaha and Kawasaki. What’s going to happen next spring? It’s great to take the ski to have it checked out well before getting back onto the water. Get your oil changed. Hose off the ski to remove any debris that’s set up residence in the winter. If you used the cover like we suggested, cleaning the ski for use is so much easier. It’s not a bad idea to care for your cover if you won’t be using it all the time during the summer months. Hose it off and make sure it dries thoroughly before storing it in a clean, dry place. Now—all that’s left is to get back out there and enjoy your personal watercraft! Next: Looking for the best cover for your Carolina Skiff JV 17 CC? We’ve got it.